Online Portfolio | Atlanta Architecture Firms | Commercial Building Architect in Atlanta | Lusk Construction Inc.
"It was a great experience working with Lusk Construction. If you ever need a reference, don't hesitate to have them call me." "Lusk Construction truly made the construction of our new building an enjoyable event. I would not hesitate to recommend them to anyone." 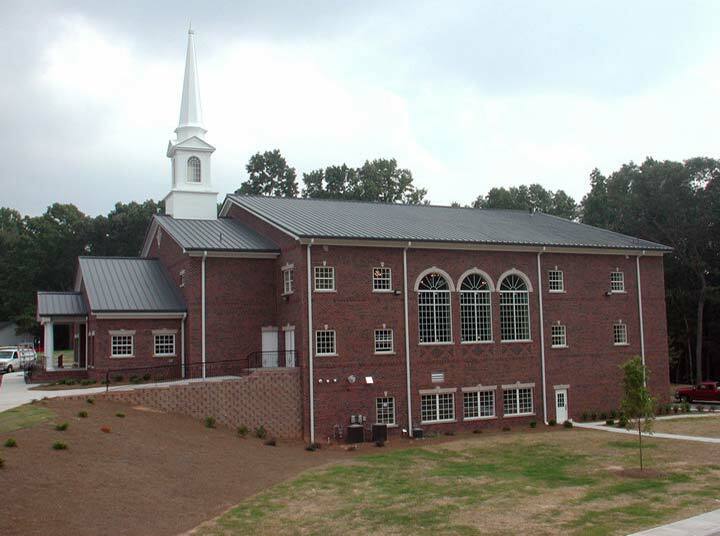 Antioch Christian Church, located at 3595 Sugar Pike Rd in the Hickory Flat-Union Hill Community in Cherokee County, Georgia is now complete. To see this job come to a close is rather bittersweet. Working with pastor Ken May, the Church committee and the congregation was a truly rewarding experience and in that respect we are sad to see this project come to a close. On the other hand, the Church hosted 500 people for worship on opening Sunday morning. What a blessing! We at Lusk Construction are very thankfull to see this new facility fulfilling its intended purpose. 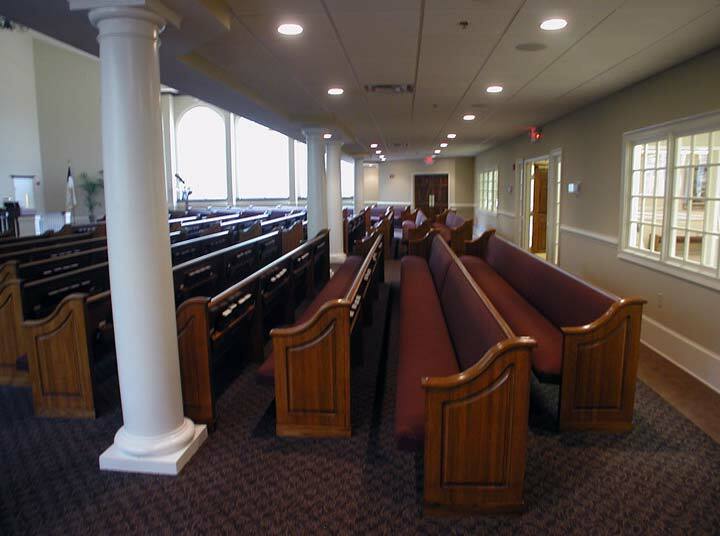 Lusk Architect Tom Morgan and the Lusk Design Team spent countless hours of design time to achieve the elegant aesthetics and details that make this church so appealing. 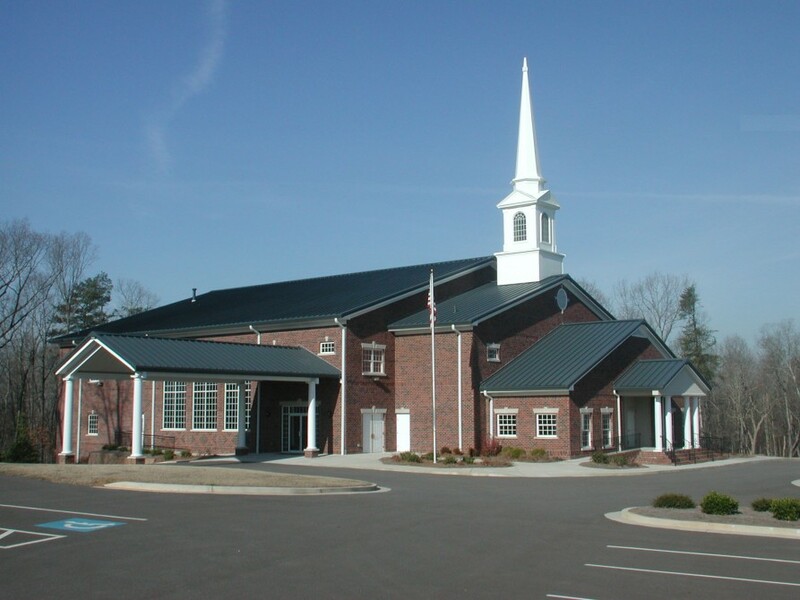 The bricked exterior of the 27,483 sf church features a covered front porch with columns, a grand 50' tall steeple, and two columned drive-thru canopies capable of handling cars and busses. The large sanctuary windows are bordered with elegant arched stone tops with keystones, limestone sills and Flemish bond brick panels below. This theme is repeated with all of the remaining windows having combinations of limestone sills, keystones, brick soldier courses and brick rowlocks. Finally, an architectural metal standing seam roof was chosen for its beauty, strength and durability. 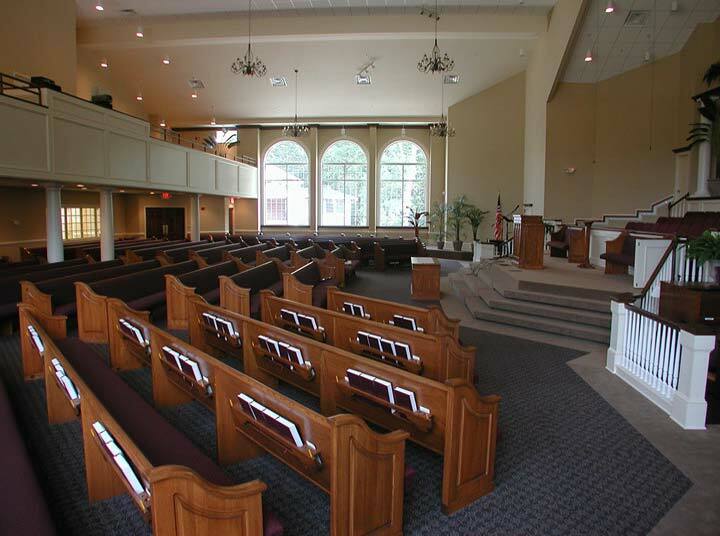 The interior is composed of a main floor for the sanctuary including classrooms, a choir rehearsal room, nurseries, a parlor (the bride's preparation room for weddings) and restrooms. The 9,793 sf basement level contains restrooms and classrooms and has plumbing stubs for a future kitchen. The remaining area is large enough to add additional classrooms and a dining hall/gathering area as needed. The upper floor is divided into two sections: The first, located above the entry foyer, contains three classrooms, an elevator to service all three floors, restrooms, an audio skybox /control room for audio video tasks. 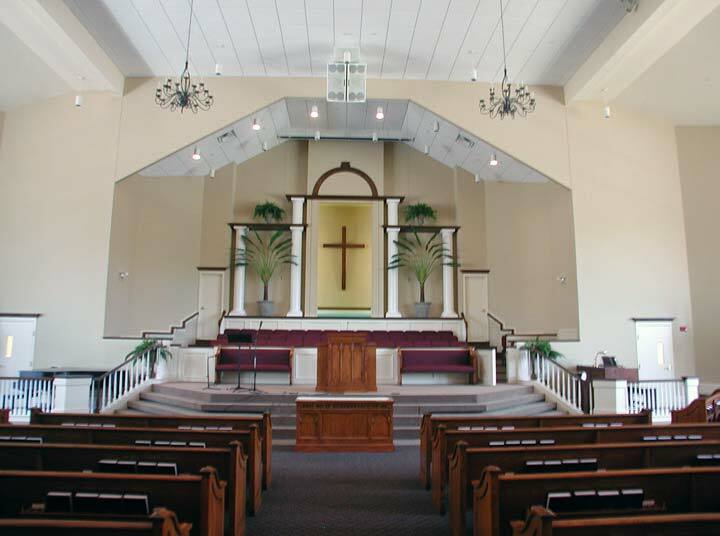 The second part of the upper floor contains two classrooms above and to the sides of the choir loft. 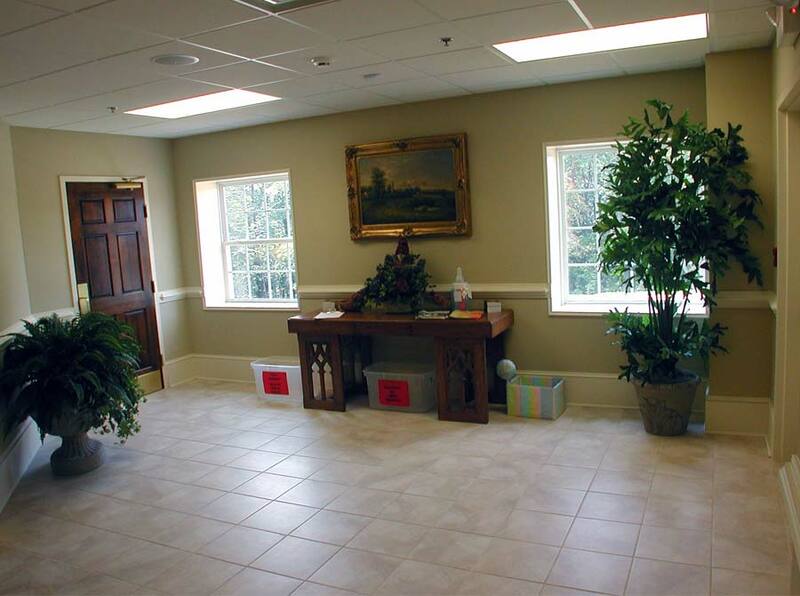 Baptistry Dressing Rooms/restrooms are located by each of these classrooms. As a closing, touching note of interest, we thought you would enjoy this. Pastor Ken May, realizing that there is more to building a church than concrete and steel, decided to build this church upon a Biblical foundation, literally. 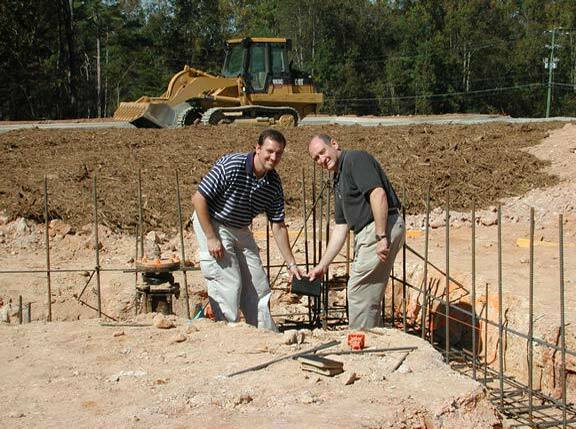 The Pastor and the Church's Youth Minister, Art Staudsberry, placed Bibles under the church's foundation. After prayer, a Bible was placed in the footing forms below the rebar clusters of the main columns on each of the four main building corners. Concrete for the footings and then the walls were poured over the Bibles. In this case the Bible has become integral in the construction of the walls, just as it is in the teachings within these walls. This church is truly built on the ROCK literally and spiritually. That's a pretty powerful statement!